As the number of measles cases linked to the California outbreak climbs to over 100, health officials are urging parents to properly immunize their children, citing unvaccinated individuals as a main contributor to the disease’s spread. Some have linked the outbreak to the anti-vaccination movement – a group whose members claim vaccinations are unsafe and ineffective. A Pew Research Center report released last week shows that a majority of Americans say children should be required to get vaccinated. Further analysis of the survey data reveals significant age differences in views about vaccines. In 2009, by contrast, opinions about vaccines were roughly the same across age groups. Also, some modest partisan divisions have emerged since 2009, when Pew Research last polled on the issue. Overall, 68% of U.S. adults say childhood vaccinations should be required, while 30% say parents should be able to decide. Among all age groups, young adults are more likely to say vaccinating children should be a parental choice. Some 41% of 18- to 29-year-olds say parents should be able to decide whether or not their child gets vaccinated; only 20% of adults 65 or older echo this opinion. Older Americans are strong supporters of requiring childhood vaccinations – 79% say they hold that view, compared with 59% of those under 30. One possible reason that older groups might be more supportive of mandatory vaccinations is that many among them remember when diseases like measles were common. Prior to the first licensed measles vaccine in 1963, hundreds of thousands of measles cases were reported annually in the U.S. In 1958 alone, there were more than 750,000 cases. A decade later, in 1968, that number fell to about 22,000, according to an analysis of data from the Centers for Disease Control and Prevention. Today, measles cases are extremely rare, but the CDC reported a spike in 2014, with more than 600 measles cases, the first such jump in more than a decade. The CDC attributed the increase to an outbreak among unvaccinated Ohio Amish communities and cases related to an outbreak in the Philippines. Although some have linked the anti-vaccination movement to more-affluent, highly educated parents, Pew Research data show little difference in people’s views based on income or education. About 30% of adults living in households earning $75,000 or more a year say parents should decide whether or not their child gets vaccinated. This holds true even among the highest of earners (those in households making $100,000 or more). These opinions are on par with people living in lower- and middle-income households. Men and women share similar views on whether vaccines should be required or not and opinions on this issue vary little by race. At the same time, slightly more parents of minor children than those without children believe vaccinating children is a parental choice. There are slight differences in views about vaccines along political lines. A majority of Democrats (76%), Republicans (65%) and independents (65%) say that vaccines should be required. But Republicans and independents are somewhat more inclined than are Democrats to say that parents should be able to decide. In 2009, there was no difference in views on vaccinations along party lines. Monica Anderson is a senior researcher focusing on internet and technology at Pew Research Center. 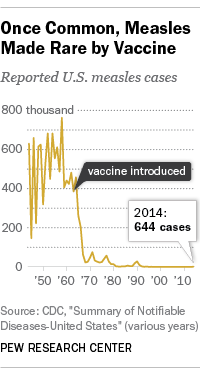 5 facts about vaccines in the U.S.